I’m thrilled to announce a NEW member benefit for AAJA Seattle members. Members in good standing are now eligible for discounted rates on classes, computer lab time and rental equipment at 911 Media Arts, Washington state’s premiere non-profit for new media art and documentary film. In today’s tough job market, media professionals with multimedia skills have the edge. 911 Media Arts offers classes in video and audio editing, Adobe Creative Suite 4, documentary film production and web design and programming. 911 Media also rents video cameras andÂ time in itsÂ Mac lab. What does this mean for AAJA members? Members can take advantage of the benefit in two ways: They can immediately get big discounts on 911 Media’s classes, obtaining the same rate as 911 Media’s members, whoÂ pay $45 a year for membership. In addition, AAJA Seattle will offer scholarships to professionals and students in 2010 to defray the cost of classes, equipment rental and lab time. What classes can I take at 911 Media? Check out 911 Media’s website for the list. Bare Bones iMovie starts Monday, Feb. 21. Beginning Final Cut Pro starts March 11. “Integrating Photoshop, After Effects and Final Cut Pro” starts March 22. If there’s a topic or skill you’re interested in but don’t see on their site, let AAJA Seattle know because 911 Media hasÂ agreed to develop customized classes for our members’ training needs. I’m unemployed. Can AAJA help with the cost of training? There are lower cost online training sources as well, but AAJA Seattle has decided to offer three $250 scholarships to professional members this year that cover half the cost of their 911 Media classes. 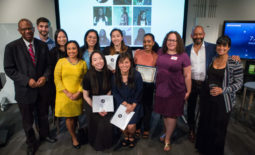 For student members, AAJA Seattle and 911 Media also are providing for two $500 scholarshipsÂ that cover the entire cost of their 911 Media classes. How do I make sure I get the discounted rate? Go to the class listing on 911 Media’s website — http://www.911media.org/education/classes — and click on the link to theÂ class you’re interested in. For example, click on “Beginning Final Cut Pro,” and when the class detail page is loaded, scroll down to the bottom of the page where you’ll see Google Checkout. You’ll select the “Member Price” when you check out. 911 Media will verify with AAJA Seattle that your membership is current. How do I apply for a scholarship to take a 911 Media class? We will likely use the same process that we use for our other scholarships. Applicants will be required to write a 250-word statement that describes how the scholarship will help them in their career and how they couldÂ use their skills or volunteer timeÂ to benefitÂ the chapter. Stay tuned for more details. If you have any questions, send an email to aajaseattle@gmail.com and use keyword “911 Media” in the subject line. We hope our members will enjoy this new benefit! We are in the middle of our membership renewal drive, so if you could please renew your membership or encourage your colleagues to join AAJA, I would appreciate it. It’s more important than ever before that we sustain our community of journalists and support each other.